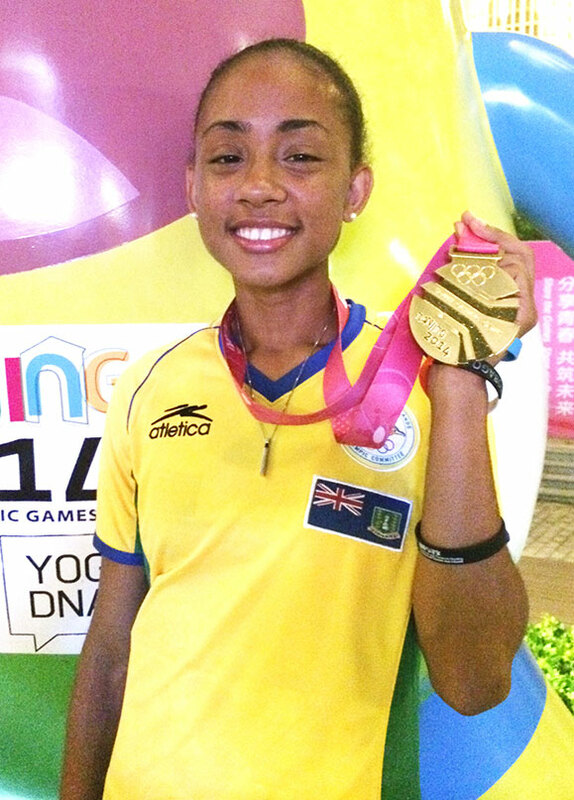 In 2010, Lakeisha “Mimi” Warner attended the inaugural Youth Olympic Games in Singapore to watch her sister and she was inspired by the event. On Tuesday, with a little help from her newfound friends from around the world—several of who didn’t even speak her language—the Warner teamed up to win a Youth Olympic Games Mixed 8 x100m Relay gold medal, at the close of the track and field segment of the Games in Nanjing, China. Warner, 17, meeting her teammates at the line for the first time to make up Team #34—four women and four men including a Shot Putter—was comprised of athletes from Romania, Russia, Venezuela, Australia, Comoros, Germany and Thailand. Warner, who ran seventh receiving the baton from Russia’s Tatiana Blagoveshehenskaia passed off to Romania’s Ioana Gheorghe and with their male teammates combined for a winning time of 1 minute 40.20 seconds. They had the second best time of 1:41.79 from the prelims entering the final. Warner was on the territory’s Medley Relay team that won IAAF World Youth Championships silver in 2013. The Mixed Relay gave both track athletes from various distances up to 3000m a chance to mix it up with their field counterparts in such events as the High Jump, Pole Vault, Javelin Throw and Hammer Throw among others. The other BVI athletes’ team did not advance to the final. Long Jumper Kala Penn’s Team had a time of 1:44.96. 400m Intermediate Hurdler Kryon McMaster’s Team ran 1:47.36. Akeem Bradshaw, a Triple Jumper, his Team had a 1:45.96 time. 100m Hurdler Deya Erickson’s Team ran 1:54.36, while Sprinter Nelda Huggins’ Team finished in 1:54.37. Huggins, 17, was sixth in the 100m A final on Saturday night. After a false start by pre race favorite Nikola Swoboda of Poland who established a National Jr. Record of 11.30 seconds in the prelims opened the door for everyone else, Huggins was unable to capitalize. She had an average start but lacked her usual finish and was timed in 11.87 seconds in sixth. She ran 11.81 to win her heat on Thursday. Lakeisha “Mimi” Warner won the C 800m final in 2 minutes 16.71 seconds. She was sixth in her 800m heat finishing in 2:18.67 seconds. Kala Penn had a best leap of 5.22m in the Long Jump to place 14th in her group and advanced to the B final also on Saturday. Kala Penn finished 6th in the Long Jump B Final. The 16 year old also recorded distances of 4.76, 5.08 and 4.93m. During the prelims, she established a best mark of 5.22m. Her Series include marks of: 5.19m, 4.89, 5.18m and 5.08m. McMaster—in just the sixth 400m Intermediate Hurdles race of his career—was running well and in the top four approaching the seventh hurdle during the prelims when he lost his concentration and pushed the hurdle down without clearing it. He was subsequently disqualified. In the B final, he was charged with a false start. Erickson ran the 100m Hurdles in 14.76 seconds but was unable to contest the C final because of an injury. Bradshaw placed fifth in the B Triple Jump final with a leap of 13.90. He had two fouls and ended the meet with a 13.60m leap. Bradshaw was 13th overall during Friday’s preliminary competition. His opening bound of 14.33m turned out to be the best effort of his series that also included marks of 14.07 and 14.22m. The A, B and C finalist were determined by performances. The best 8-9 times or measurements advance to the A finals and compete for the medals. The next best 8-9 finishers were placed in B finals and the rest in C finals. B and C finalists are not awarded medals.